The volcanic landscape of the Afar region in northern Ethiopia results from tectonic forces working deep below the surface. Here, Africa is splitting apart. The northeastern portion of the African Plate, comprising the Horn of Africa, is pulling away from the main portion of the plate at a rate of 1 to 2 centimeters per year, creating the Ethiopian Rift. The tectonically active nature of the Ethiopian Rift expresses itself in the many volcanic features in this area, including Erta Ale, one of the world’s most active volcanoes, and numerous other volcanic cones and fissures. In November 2008, a lava flow erupted from a linear volcanic fissure in the northern part of the Erta Ale Ridge, located between two of the region’s active volcanoes, Alu and Dalaffilla. 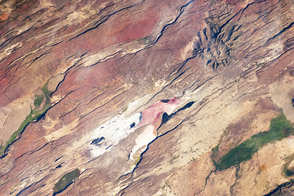 In this true-color image captured by the Formosat-2 satellite on December 25, 2008, the fissures that produced the eruption can be seen in the lower center, between Alu (the oval-shaped landform in the upper left) and Dalaffilla (the pale, crater-topped peak in the lower right). New lava has spread several kilometers to the northeast, and to a lesser extent to the south and southwest. These fresh flows appear darker than the older layers of lava, which have weathered to brown. A close examination of the fissure reveals a ridge topped by a row of small cones—spatter cones formed by lava springing from the fissure—some of which are grouped in clusters, trending south-southeast to north-northwest. A similarly formed fissure runs almost parallel a short distance to the north. More eruptive fissures occur to the west of Alu, on the far left of this image. 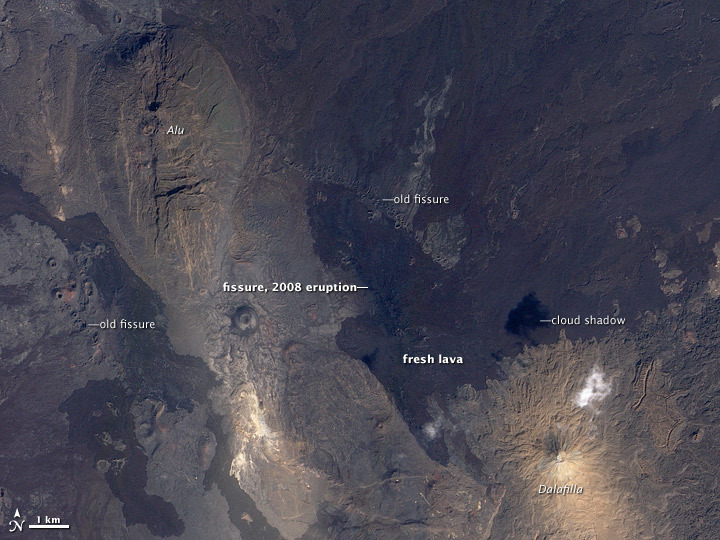 NASA’s Moderate Resolution Imaging Spectroradiometer (MODIS) detected thermal hotspots at the site of this eruption until the end of December 2008. The meeting places at the edges of tectonic plates that are pulling apart are known as spreading ridges, and they are characterized by effusive eruption of lava—upwelling of melted rock from the mantle—rather than ash explosions. As the lava spreads and cools it forms new rocky crust. Most spreading ridges occur beneath the seas, where mid-ocean ridges continually produce new seafloor. They are rare on land, namely at the Ethiopian Rift and Iceland, which straddles the Mid-Atlantic Ridge. The Ethiopian Rift is only the northern part of the East African Rift System, a vast and complex geological feature that extends from the Red Sea to Tanzania. To the north, the Arabian Plate is pulling away from the African Plate in a northerly direction, a movement that has produced—and continues to widen—the Red Sea and the Gulf of Aden. Formosat image © 2008 Dr. Cheng-Chien Liu, National Cheng-Kung University, and Dr. An-Ming Wu, National Space Organization, Taiwan. Caption by Dr. Ralph Harrington, the Volcanism Blog. The landscape of the Afar region in northern Ethiopia results from tectonic forces working deep below the surface, both splitting Africa apart and producing volcanic eruptions. 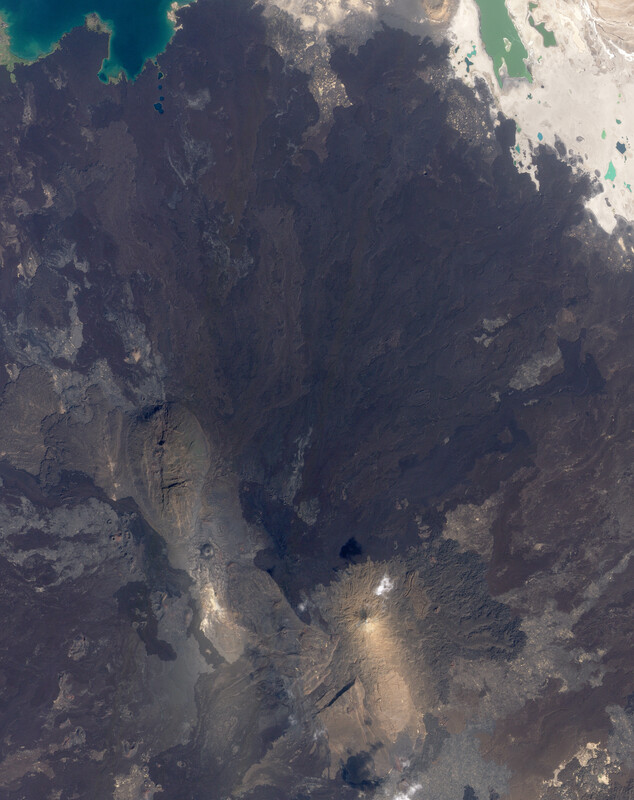 Lava from a November 2008 eruption at the Erta Ale Range remained visible months later. Afar Rift Consortium (2008). The Afar Rift, Ethiopia. Accessed January 29, 2008. Wood, J., Guth, A. (2008). East Africa’s Great Rift Valley: A Complex Rift System. Geology.com. Accessed January 29, 2009.